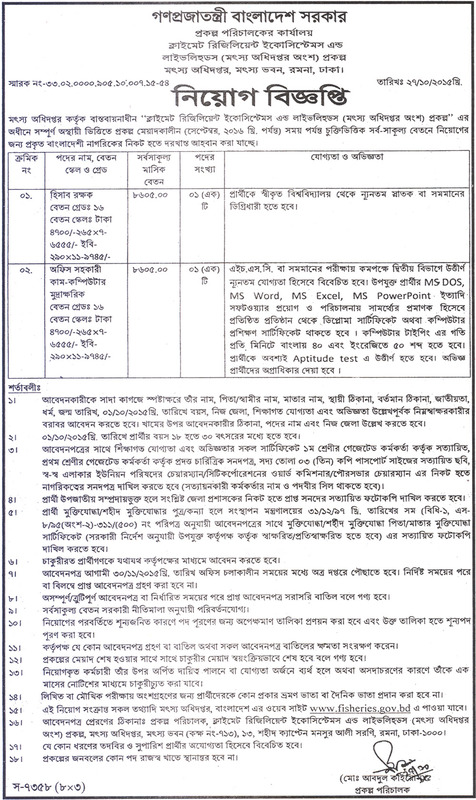 Department of Fisheries job circular published last 27th October 2015. The circular has been declared for 2 vacancies post. We got the circular source by The Daily Ittefaq Newspaper of Bangladesh. Fisheries department website- www.fisheries.gov.bd. Fisheries Department two vacancies post as Accountant and Office Assistant CAM Computer Typists. Both post application submission last date on next 30 November 2015. And both post candidates age between 18 years old to 30 years old. Only quotas candidates to be gets priority for age. Age- 18 to 30 years old. Fisheries Department for this post applicants must be 4th years graduation completed any reputed universities of Bangladesh. The post vacancies post is one. And the post selected candidates to be gets 8650 Taka with others Government allowance. Candidates known computer operator. Office Assistant CAM Computer Typist post selected candidates per monthly salary will come 8650 Taka. The post candidates educational qualification minimum HSC or equivalent passed. And must be known computer operating as MS DOS, MS Word, MS Excel, MS Power point and others operating systems. Interested candidates can be apply at now. Because time is very short for application. Remember that the job application last date on next 30 November 2015. The cross the application times any application not be granted. So do not delay for apply above the two post of Fisheries Department. You can be likes our Facebook fan page, because if you likes the page, then automatically you to be gets more job circular of yours Facebook timeline.